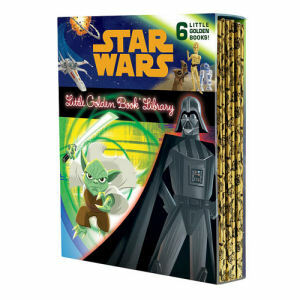 We have Just Sold out of Star Wars Little Golden Books Library Boxed Set. Not to Worry! Fill in the Notify me When Available and you will be the first in line for our restock of Star Wars Little Golden Books Library Boxed Set !! From the Star Wars collection by Penguin Random House. Star Wars Little Golden Books Library Boxed Set. The first 6 episodes of the epic Star Wars space saga-The Phantom Menace - Attack of the Clones - Revenge of the Sith - A New Hope - The Empire Strikes Back - Return of the Jedi. Each book measures about 8 inches tall by 6.5 inches wide. Ages 10 and up.